With just two delisting offers out of eight stealing the show, the year saw its biggest aggregated offer size since 2004. 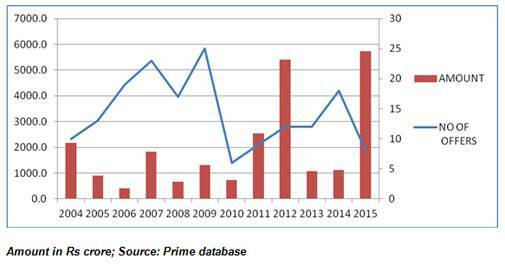 The turbulent equity market in 2015 declined around 5 per cent and recorded dismal corporate earnings growth of -1.3 per cent in 2014/15. The year could also be termed exceptional in terms of corporate privatisation. According to PRIME Database, 2015 witnessed eight successful delisting offers of around Rs 5,739 crore - the highest amount for over a decade - with Essar Ports and Essar Oil having the lion's share with Rs 5,172 crore. The delisting of Essar Oil, which had an issue size of around Rs 3,745 crore, was not only the largest on the Indian bourses, but was marred by controversy over the lack of transparency in its stake sale talks with Rosneft. The Securities and Exchange Board of India (Sebi) directed the company to raise the delisting price in line with the valuations that the Russian oil major had offered. However, if one excludes the Essar Group offers, the size of the remaining six offers were almost on par with what we witnessed in 2010 - the year with the lowest number of delisting offers. It was also the second lowest in terms of the offer size since 2006. Says Pranav Haldea, Managing Director, PRIME Database: "The Essar delisting skewed the amount and as such it was not symbolic of any trend." Since July 2010, when market regulator Sebi made it compulsory for listed companies to increase public shareholding to a minimum of 25 per cent, companies had been racing to meet the public shareholding norm. Moreover, more and more multi-national companies started acquiring the entire equity stake in their Indian arms. Four MNCs got delisted in 2012 followed by three in 2013 and four in 2015. 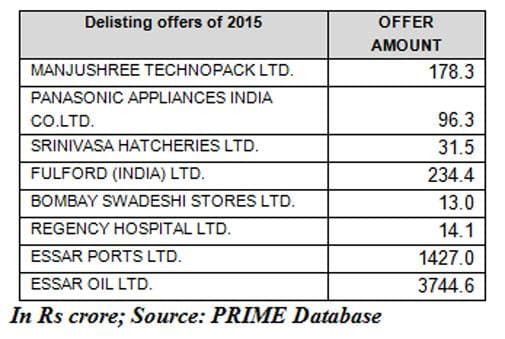 Between 2011 and 2013, there were 33 delisting offers with a total issue size of over Rs 9,000 crore. This was also the time when the markets fell, registering marginal growth of 3 per cent. "Delisting, buy-backs and take-overs gain prominence in bearish markets as promoters use this opportunity to consolidate their position at lower valuations," says Haldea. Making voluntary delisting easier for companies, capital markets regulator Sebi recently notified new regulations that would reduce the time taken for completing the process and provides for relaxation on a case by case basis. This, however, does not seem to have significantly impacted the pace of delisting. "These regulations have definitely simplified the process, However, launching a delisting offer depends upon the promoter's willingness," says Haldea. Indian firms raised Rs 68,608 crore through the equity markets in 2015, growing 76 per cent year-on-year. The year also witnessed a revival in initial public offerings (IPOs) after four disappointing years. 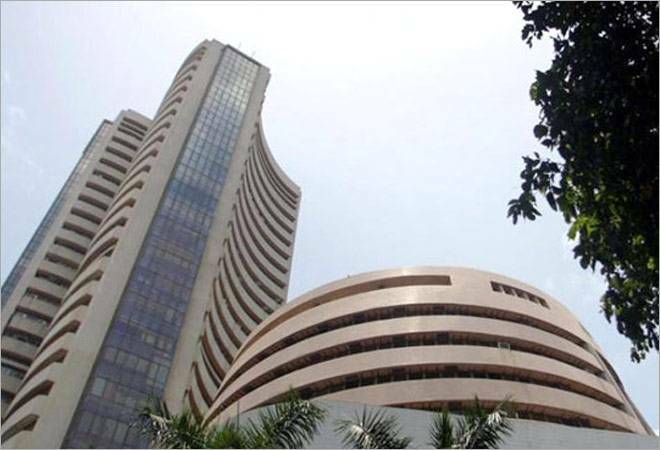 According to PRIME Database, 21 main-board IPOs came to the market in 2015 collectively raising Rs 13,602 crore. The highest-ever mobilisation through IPOs was in 2010 at Rs 37,535 crore. Let's see what's in store this New Year.